We performed the final concert of the tour in Leipzig tonight. 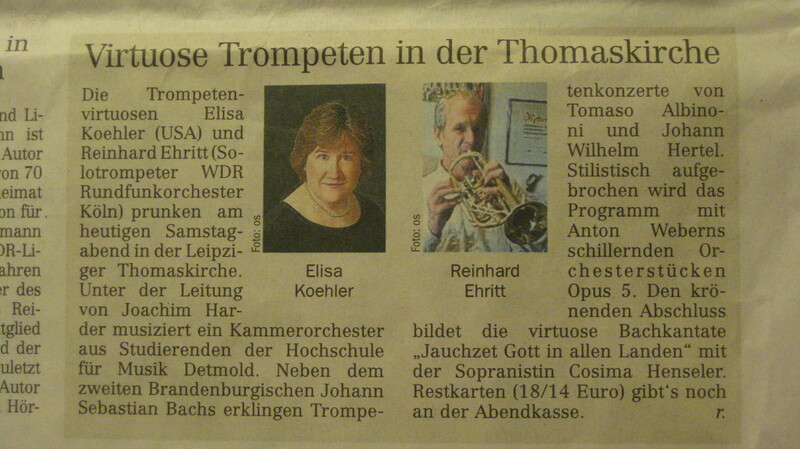 It was such a privilege to perform in the Thomaskirche. As you can see, we performed from the balcony in the back of the church which was much larger than I thought it would be. Everyone is clamoring for video from the concert, so without further ado, here it is! Elisa–This amazing concert project and the documentation of it on your blog is a wonderful blending of your own stated interests in history and technology and an impressive statement of who you are as a musician, scholar, adventurer, and leader. Thanks for including us. Hello, Dante! Thank you for your message (comment)! I will post the Second Mvt. of the Brandenburg later today as well as the central movements of the cantata for Cosima. I apologize for not uploading them sooner, but I had very limited time after the concert in Leipzig to post the other clips and I promised Reinhard that I would post his Bach movements, too. Stay tuned! It was a wonderful pleasure to perform with you these past two weeks and I wish you all the best for the rest of your studies in Detmold. You are an enormously gifted musician with a bright future! Great to see all this and hear your performances. Very cool. See you in Feb.